The textcosmetics.selectors.chatcolor permission grants access to the Chat Color Selector. See TextCosmetics' Chat Color Selector from the Chat Color Selector Wiki. The textcosmetics.selectors.namecolor permission grants access to the Name Color Selector. See TextCosmetics' Name Color Selector from the Name Color Selector Wiki. The textcosmetics.selectors.itemcolor permission grants access to the Item Color Selector. 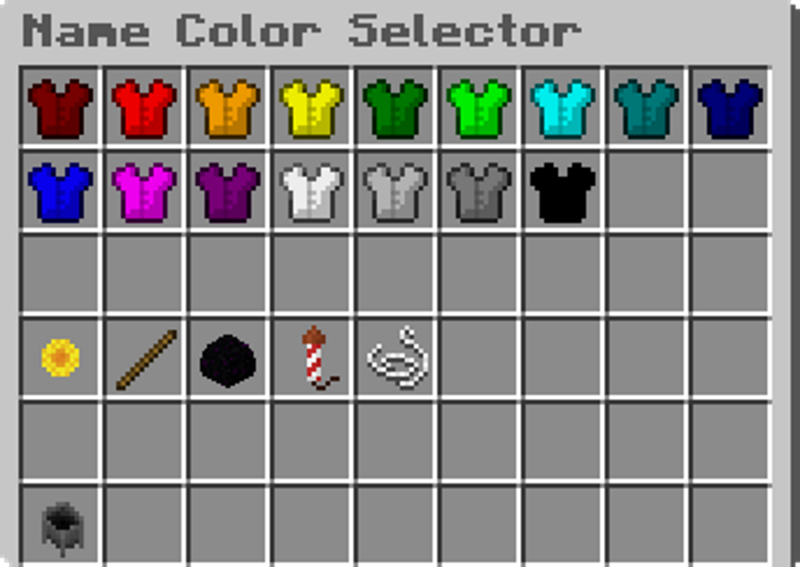 See TextCosmetics' Item Color Selector from the Item Color Selector Wiki. The textcosmetics.commands.chatcolor permission grants access to the /chatcolor <code> command. The textcosmetics.commands.chatcolor.others permission grants access to the /chatcolor <code> <player> command. The textcosmetics.commands.chatcolorinfo permission grants access to the /chatcolorinfo command. The textcosmetics.commands.chatcolorinfo.others permission grants access to the /chatcolorinfo <player> command. The textcosmetics.commands.chatcoloradd permission grants access to the /chatcoloradd <code> command. The textcosmetics.commands.chatcoloradd.others permission grants access to the /chatcoloradd <code> <player> command. The textcosmetics.commands.chatcolordelete permission grants access to the /chatcolordelete <code> command. The textcosmetics.commands.chatcolordelete.others permission grants access to the /chatcolordelete <code> <player> command. The textcosmetics.commands.namecolor permission grants access to the /namecolor <code> command. The textcosmetics.commands.namecolor.others permission grants access to the /namecolor <code> <player> command. The textcosmetics.commands.namecolorinfo permission grants access to the /namecolorinfo command. The textcosmetics.commands.namecolorinfo.others permission grants access to the /namecolorinfo <player> command. The textcosmetics.commands.namecoloradd permission grants access to the /namecoloradd <code> command. The textcosmetics.commands.namecoloradd.others permission grants access to the /namecoloradd <code> <player> command. The textcosmetics.commands.namecolordelete permission grants access to the /namecolordelete <code> command. The textcosmetics.commands.namecolordelete.others permission grants access to the /namecolordelete <code> <player> command. The textcosmetics.commands.itemcolor permission grants access to the /itemcolor <code> command. The textcosmetics.commands.itemcolor.others permission grants access to the /itemcolor <code> <player> command. The textcosmetics.commands.itemcolorinfo permission grants access to the /itemcolorinfo command. The textcosmetics.commands.itemcolorinfo.others permission grants access to the /itemcolorinfo <player> command. The textcosmetics.commands.itemcoloradd permission grants access to the /itemcoloradd <code> command. The textcosmetics.commands.itemcoloradd.others permission grants access to the /itemcoloradd <code> <player> command. The textcosmetics.commands.itemcolordelete permission grants access to the /itemcolordelete <code> command. The textcosmetics.commands.itemcolordelete.others permission grants access to the /itemcolordelete <code> <player> command. The textcosmetics.commands.itemname permission grants access to the /itemname <name> command. The textcosmetics.commands.colorcredits permission grants access to the /colorcredits command. The textcosmetics.commands.colorcredits.others permission grants access to the /colorcredits <player> command. The textcosmetics.commands.colorcredits.pay permission grants access to the /colorcredits <player> pay <amount> command. The textcosmetics.commands.colorcredits.give permission grants access to the /colorcredits <player> give <amount> command. The textcosmetics.commands.colorcredits.set permission grants access to the /colorcredits <player> set <amount> command. The textcosmetics.commands.colorcredits.take permission grants access to the /colorcredits <player> take <amount> command. The textcosmetics.commands.help permission grants access to the /textcosmetics help command. The textcosmetics.commands.reload permission grants access to the /textcosmetics reload command. The textcosmetics.notify.join.colorcredits permission grants access to being notified on join of how many ColorCredits you have. The textcosmetics.notify.join.chatcolor permission grants access to being notified on join of what chat color you have. The textcosmetics.notify.join.namecolor permission grants access to being notified on join of what name color you have. The textcosmetics.notify.join.itemcolor permission grants access to being notified on join of what item color you have. The textcosmetics.colors.chat.0 permission grants access to the Black chat color. The textcosmetics.colors.chat.1 permission grants access to the Dark Blue chat color. The textcosmetics.colors.chat.2 permission grants access to the Dark Green chat color. The textcosmetics.colors.chat.3 permission grants access to the Dark Aqua chat color. The textcosmetics.colors.chat.4 permission grants access to the Dark Red chat color. The textcosmetics.colors.chat.5 permission grants access to the Dark Purple chat color. The textcosmetics.colors.chat.6 permission grants access to the Gold chat color. The textcosmetics.colors.chat.7 permission grants access to the Gray chat color. The textcosmetics.colors.chat.8 permission grants access to the Dark Gray chat color. The textcosmetics.colors.chat.9 permission grants access to the Blue chat color. The textcosmetics.colors.chat.a permission grants access to the Green chat color. The textcosmetics.colors.chat.b permission grants access to the Aqua chat color. The textcosmetics.colors.chat.c permission grants access to the Red chat color. The textcosmetics.colors.chat.d permission grants access to the Light Purple chat color. The textcosmetics.colors.chat.e permission grants access to the Yellow chat color. The textcosmetics.colors.chat.f permission grants access to the White chat color. The textcosmetics.colors.name.0 permission grants access to the Black name color. The textcosmetics.colors.name.1 permission grants access to the Dark Blue name color. The textcosmetics.colors.name.2 permission grants access to the Dark Green name color. The textcosmetics.colors.name.3 permission grants access to the Dark Aqua name color. The textcosmetics.colors.name.4 permission grants access to the Dark Red name color. The textcosmetics.colors.name.5 permission grants access to the Dark Purple name color. The textcosmetics.colors.name.6 permission grants access to the Gold name color. The textcosmetics.colors.name.7 permission grants access to the Gray name color. The textcosmetics.colors.name.8 permission grants access to the Dark Gray name color. The textcosmetics.colors.name.9 permission grants access to the Blue name color. The textcosmetics.colors.name.a permission grants access to the Green name color. The textcosmetics.colors.name.b permission grants access to the Aqua name color. The textcosmetics.colors.name.c permission grants access to the Red name color. The textcosmetics.colors.name.d permission grants access to the Light Purple name color. The textcosmetics.colors.name.e permission grants access to the Yellow name color. The textcosmetics.colors.name.f permission grants access to the White name color. The textcosmetics.colors.item.0 permission grants access to the Black item color. The textcosmetics.colors.item.1 permission grants access to the Dark Blue item color. The textcosmetics.colors.item.2 permission grants access to the Dark Green item color. The textcosmetics.colors.item.3 permission grants access to the Dark Aqua item color. The textcosmetics.colors.item.4 permission grants access to the Dark Red item color. The textcosmetics.colors.item.5 permission grants access to the Dark Purple item color. The textcosmetics.colors.item.6 permission grants access to the Gold item color. The textcosmetics.colors.item.7 permission grants access to the Gray item color. The textcosmetics.colors.item.8 permission grants access to the Dark Gray item color. The textcosmetics.colors.item.9 permission grants access to the Blue item color. The textcosmetics.colors.item.a permission grants access to the Green item color. The textcosmetics.colors.item.b permission grants access to the Aqua item color. The textcosmetics.colors.item.c permission grants access to the Red item color. The textcosmetics.colors.item.d permission grants access to the Light Purple item color. The textcosmetics.colors.item.e permission grants access to the Yellow item color. The textcosmetics.colors.item.f permission grants access to the White item color. The textcosmetics.formats.chat.k permission grants access to the Magic chat format. The textcosmetics.formats.chat.l permission grants access to the Bold chat format. The textcosmetics.formats.chat.m permission grants access to the Strike chat format. The textcosmetics.formats.chat.n permission grants access to the Underline chat format. The textcosmetics.formats.chat.o permission grants access to the Italic chat format. The textcosmetics.formats.chat.r permission grants access to the Reset chat format. The textcosmetics.formats.name.k permission grants access to the Magic name format. The textcosmetics.formats.name.l permission grants access to the Bold name format. The textcosmetics.formats.name.m permission grants access to the Strike name format. The textcosmetics.formats.name.n permission grants access to the Underline name format. The textcosmetics.formats.name.o permission grants access to the Italic name format. The textcosmetics.formats.name.r permission grants access to the Reset name format. The textcosmetics.formats.item.k permission grants access to the Magic item format. The textcosmetics.formats.item.l permission grants access to the Bold item format. The textcosmetics.formats.item.m permission grants access to the Strike item format. The textcosmetics.formats.item.n permission grants access to the Underline item format. The textcosmetics.formats.item.o permission grants access to the Italic item format. The textcosmetics.formats.item.r permission grants access to the Reset item format. Maximums set how many colors or formats a player can have in their color, whether chat, name, or any other color type. 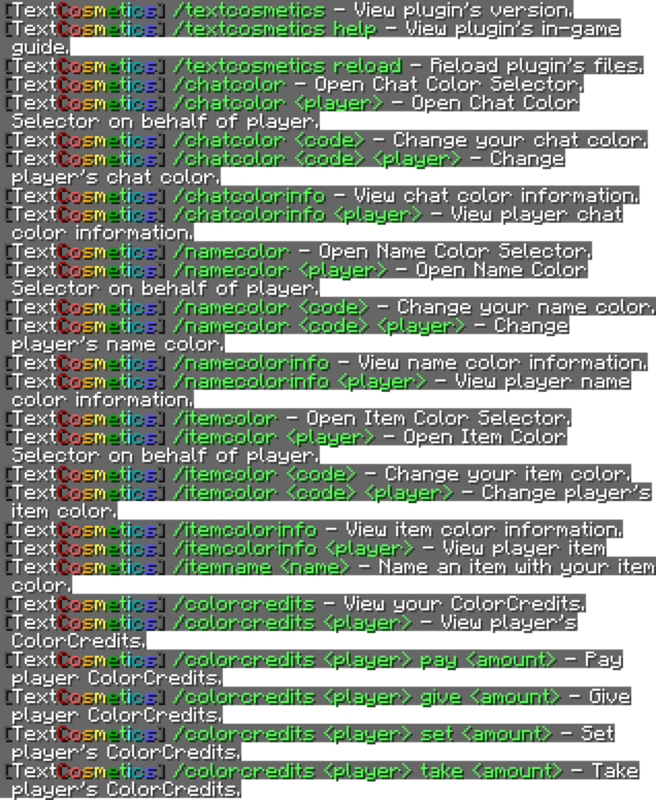 For example, if Player_A had the textcosmetics.colors.chat.max.2 permission, Player_A can only use 2 chat colors in one chat color. Meaning Player_A could have a chat color of Dark Blue with Aqua, because Dark Blue (1) + Aqua (1) = 2 chat colors. But Player_A couldn't have a chat color of Dark Blue with Aqua and Green, because Dark Blue (1) + Aqua (1) + Green (1) = 3 chat colors. Note: If a player doesn't have a max color permission given, the player automatically gets access to an unlimited amount of chat colors in one chat color. The textcosmetics.colors.chat.max.<amount> permission grants access to <amount> chat colors in one chat color. The textcosmetics.formats.chat.max.<amount> permission grants access to <amount> chat colors in one chat color. The textcosmetics.colors.name.max.<amount> permission grants access to <amount> name colors in one name color. The textcosmetics.formats.name.max.<amount> permission grants access to <amount> name colors in one name color. The textcosmetics.colors.item.max.<amount> permission grants access to <amount> item colors in one item color. The textcosmetics.formats.item.max.<amount> permission grants access to <amount> item colors in one item color. The textcosmetics.bypass.chatcolor permission grants access to bypass the fee of a chat color. The textcosmetics.bypass.namecolor permission grants access to bypass the fee of a name color. The textcosmetics.bypass.itemcolor permission grants access to bypass the fee of an item color. The textcosmetics.bypass.itemname permission grants access to bypass the fee of setting an item's name.